200 pos SODIMM connector for LPC3141 OEM Board. Expansion connector to 3.2 inch QVGA TFT color LCD with touch panel. 3 Expansion connectors with all cpu signals. USB OTG or Host connectors. 3.5mm Audio connectors (mic in, 2x line out, headphone out). 3 terminal screw connector for battery. Power supply, either via Li-ion battery, USB or external 9-15V DC. LPC3141 OEM Board is powered with Li-ion battery or +5V. 100/10Mbps Ethernet interface (DM9000 based). UDA1380 I2S codec with mic in, line in, line out, and headphone out. Current monitors on input power voltages. RS232 alternative interface on UART. XBee™ RF-module alternative interface on UART (note that XBee module is not included in bundle). 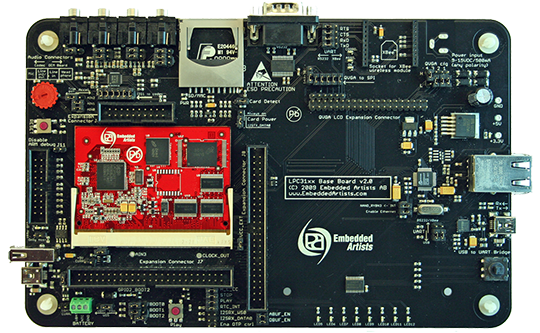 Note: Specifications for the OEM board is available on the LPC3141 OEM board page.